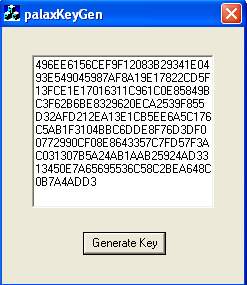 This KeyGenMe is pretty nice since it's got some public key cryptography inside it. You can download the original exe file, my KeyGen source file and the tools used from here. As you can see there is some calls to Miracl library functions and it could identify an SHA hash function inside the binary. Let's keep this in mind while analyzing further with IDA. I recommend you to download some Miracl signatures for IDA so that it can identify the library functions for us. The first dword of a mirvar represents its length in 32bit words. So 20h means that the modulus is 1024 bits long. Repeating this process we will extract the public exponent: E in RSA scheme. These two values were hardcoded into the original file each byte XOR'ed with 0x01. .text:00402649 push    offset asc_40D0FC ; "%x"
Interesting, the above code is retrieving our HDD serial number and printing it as an hex ascii string into a local variable. Ok, the HDD serial number is retrieved, printed to an ASCII hex string and then hashed. I checked the hash with a standard SHA-1 implementation and it differed from the 20-byte hash calculated by the keygenme. So I checked also SHA-0 which just differs from SHA-1 in a rotation but it didn't match either. I didn't want to waste so much time in identifying the used hash function so I decided to rip out the code from the binary itself (see sha.asm file in my sources) and build an object which will be linked against my KeyGen to produce exactly the same hash value. and compared with the previously calculated value C. If both match, then we have entered the right Serial. We can see that to find a valid Serial we must know D (private exponent) and therefore we've got to compute it somehow. So, given P,Q and E we could easily obtain D. The problem is that factorizing N (1024-bit number) into P*Q is not feasible since it would take a nice amount of years. Sometimes low private exponents are chosen to speed up the decryption process. However if it falls inside these bounds we can compute it very fast. I will use the RAT (RSA Attacking Tool) by bLaCk-eye which is a very powerful tool to attack RSA in several ways. Besides he distributes this application with its source code and I recommend you to have a look at it. Please note that only the first 8 bytes of the hash output are used for the above calculation. For a further understanding of the process have a look at the source code included. 32 KB of internal SRAM and 512 KB of on-chip flash program memory. 128-bit wide interface/accelerator enables high-speed 60 Mhz operation. Two 8-channel 10-bit ADCs with conversion times as low as 2.44 us per channel. Up to forty-seven 5 V tolerant general purpose I/O pins in tiny LQFP64 package. Audio playing support with earphones connector. Connected to the DAC output of the microcontroller through an audio amplifier circuit. It is possible to use the DAC output for another purposes. Audio recording support with microphone connector. Connected to one of the ADCs channels of the microcontroller through an audio amplifier and signal conditioning circuit. It is possible to use the ADC input for another purposes. Selectable power supply input: directly from USB or from external battery for standalone applications (Vin ranging from 3.3V to 20V). RS232 interface through DB9 connector. USB communication through USB Type-B connector (on-board USB-Serial converter). RX and TX leds. 8 General Purpose LED's connected to the microcontroller through an output buffer which can be disabled through a jumper in case that these GPIO pins are needed. General purpose button connected to one of the external interrupts of the microcontroller. In Circuit Programming interface up to 115200 bps. 12 MHz crystal for operation up to 60 MHz. MMC/SD memory card interface connected to the SPI bus of the microcontroller. Integrated Li-Ion / Li-Po Battery charger. It can charge batteries from USB or external power supply with LED charge indicators. All the GPIO pins are available in the board. Including JTAG interface for programming / debugging in circuit. Battery level monitoring. The input voltage is connected to one of the ADC inputs of the microcontroller through a voltage divisor so that it can be measured by software. As the ARM architecture is being more and more popular there are lots of development tools available for all the platforms. Most of these tools are part of GNU arm-elf toolchain distributions so you can easily develop /program the LPC2138 microcontroller under GNU/Linux. Also, you can find some good commercial software for ARM microcontrollers/microprocessors like the ARM RealView Development Suite. In some applications an RTOS (Real Time Operating System) is needed and there are some of them available for this microcontroller. I would stand out the following ones: FreeRTOS (free for non-commercial purposes) and RealView RL-ARM. This is a really easy crackme for Windows which I solved in no more than 5 minutes. I have chosen this one to make a simple tutorial for those who are starting with Reverse Engineering so here we go. You can see the original crackme page here. Okay, we can see the 'Bad Boy' message so let's open the exe file with IDA and look for that string. Once found we can get all its references by pressing Ctrl+X and see where in the code it is being used. As you can see in the flow chart, there is a loop making some calculations and after that, the bad/good boy decission is taken. We could patch the jump so that we always get the Good Boy but the first rule was 'no patching' so we have to find out how the program works to write a keygen. So let's focus in the inputs of the loop and the loop itself. As you can see below there are some calls to GetDlgItemTextA function which will get the strings from the DialogBox with the name / serial we have entered. cmp     eax, ebx			; i == name_length? cmp     ecx, eax			; do they match? push    offset aGoodBoy ; "Good Boy!" push    offset aTerimaKasihKer ; "Terima kasih kerana mencuba"
This is an easy and good one for your first steps at RE because it's got no protections and you have to reverse a simple algorithm. In this tutorial I will explain how to solve a crackme rated level 4 at crackmes.de from DrSpliff which I found very interesting. You can download the original author's file from here. You can download both the original file and the patched one created by me from here. This crackme uses the basic principals and building blocks of software protection on Unix systems with a little bit of crypto thrown in to piss you off. Actually this is not a Linux dependent crackme since it's got no specific Unix/Linux protections but it was compiled for it though. First thing we do is executing the binary (although I trust crackmes.de I use to have a quick look at the binaries to avoid malicious code being executed on my machine). Having a quick look at the binary and loading it into gdb it seems that the author's not used any antidebugging techniques nor ELF header corruption so we can freely analyze / disassemble it. First I opened it with IDA (my favourite disassembler. It's for Windows but you can run it under wine) to analyze the program flow with its nice Graph View. 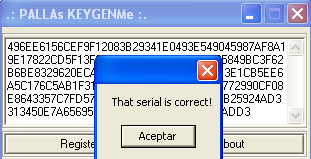 Quickly I can see where in the code it reads our name / serial (see image). At the beggining of the loop, edi is pointing to our buffer and it's being processed in blocks of 8 bytes (64 bits). Notice the 4-bit shifts to the left and the 5-bit shifts to the right. It looks familiar... hmm, maybe TEA? That's it! Having a look at a public implementation of TEA algorithm we can say for sure it is and this is actually the decoding function. If this is the decoding function, the key used shouldn't be too far away and the stack is a good place to look at first. Indeed, it's there and it looks like it's been hardcoded by the author (at least there are no x-refs to it). Interesting huh? The address at 'ds:addr' is actually our decrypted buffer. The mprotect function call is used to set protection of a memory mapping and as we can see in the code above the protection argument is zero or (PROT_NONE) to allow execution of the memory which is about to be executed in the 'call ds:addr' instruction. The arguments of the function which is supposed to be in 'ds:addr' are two procedures: sub_804855B and sub_80484FC. Clearly these procedures are the 'bad and good' boys. I could try to change the code so that the good boy address is pushed twice onto the stack but the function at 'ds:addr' could check that the two parameters are distinct and this wouldn't be a real crack 🙂 I'd like to dig more into the executable to find out what the author really pretended. 0x804a044:      cmpb   $0x0,(%edx)         ; name[i] == '' ? The good boy is at ebp+0x0C and the bad boy at ebp+0x10C. The routine performs a simple algorithm and then compares the result to the serial we entered. If they match, then we'll have the good boy. We can see that writing a keygen is pretty easy now and that's why I won't do it. So, by simply nopping the 'jne 0x804a057' instruction located at 0x804a04c we'll get the application to show the good boy no matter whether the serial is right or not. To do this we have to dump these 56 bytes, patch and re-cypher them using TEA with the same key. So now it's time to cypher this data using the same key so that when our program decrypts it, we always get the good boy. Actually the only block (8 bytes long) which has changed's been obviously the one containing the NOP'ed JNZ so its bytes are to be substituted in the original binary file. We open it with our favourite hex-editor and patch the file. Open the file with an hexeditor and change the 0x75 (JNE opcode) byte at 0x6d8 by a 0xEB (JMP opcode). This is a typical 'strlen' and the jump to 0x804869A is taken just if the length of the name is > 0. So if we want to skip this restriction, we could patch the JA opcode the same way: Replacing the 0x77 (JA) byte at 0x68C offset of the file by a 0xEB (JMP). Hope you enjoyed this article and found it useful. Reverse engineering (RE) is the process of discovering the technological principles of a device, object or system through analysis of its structure, function and operation. It often involves taking something (e.g. a mechanical device, electronic component, or software program) apart and analyzing its workings in detail, usually to try to make a new device or program that does the same thing without copying anything from the original. I'm really interested in security related to both software and hardware and this is the reason why I like Reverse Engineering so much. I am not a guru of this art though but I try some challenges from time to time (most of them from http://www.crackmes.de) specially those who include some kind of crypto protection. In this category I will write some tutorials of the crackmes I manage to solve. So I'd recommend to all of you who are interested in RE to keep an eye on my blog and crackmes.de as well. ARM Architecture. Design and Optimization. January 18, 2008 / dani / Comments Off on ARM Architecture. Design and Optimization. I have worked on several platforms based on ARM cores: ARM7, ARM9 and XScale. ARM architecture has been present in more than 2 billion embedded products over the last 10 years, ranging from cell phones to automotive braking systems. I think ARM architecture is great for embedded computers and I needed to learn it so that I could get its best. The best book I found on this is 'ARM System Developer's Guide' by Andrew Sloss (ARM Inc.), Dominic Symes (ARM Ltd.) and Chris Wright (Ultimodule Inc.). It covers all the ARM cores, XScale processors, demonstrates how to implement DSP algorithms, describes cache technologies that surround the ARM cores, as well as efficient memory management techniques. Among the tasks I've had to deal with I'd point out Artificial Vision and Vocoders implementation for being computationally expensive. In vocoders implementation and optimization case, I had to face some large of Digital Signal Processing issues which leaded me to write assembly code in order to get the best performance. Also I had to focus in the cache usage because it can speed up the execution time amazingly. Not to mention avoiding pipeline stalls and efficient use of the registers. The mentioned book covers all these topics both with theory and practical examples. There's a dedicated chapter about DSP which even includes source code ready to use. The above code is not efficient, we can avoid the 3 steps loop: ADD 1 to i, comparison and the conditional branch instruction. As you can see, the loop work is done entirely by the subs and bne instructions. The comparison with zero is free since the result is stored in the condition flags. Thus we can see that it's more efficient to make decrementing loops in ARM than incrementing ones. At first, one may think that declaring i as char uses less register space or less space on the ARM stack than an int. On ARM these assumptions are wrong and that's why the output code includes the AND instruction with 0xFF which actually slows the execution without saving space. So our checksum_eff function is pretty much faster without not so much effort just by knowing a little bit about ARM architecture. Rewriting C functions is the first thing that should be done when optimizing before digging down into assembly. Special care must be taken in those functions with nested loops or with too many iterations. It's also useful some profiling tool like Intel VTune Performance Analyzer to check if all our optimizations are really optimizations and how much we have speeded its execution up. Slayer is a special robot for me. It was my first line following robot and he has won several National Robotics Contests in Spain (Robolid and X-Treme Robotrackers at Campus Bot). It's got just two motors: a servo motor to stick its nose to the line and a DC motor with a small gearbox to achieve the movement. The control board is based on ATMega32 which is a very nice 8bit microcontroller equiped with 32KB of Flash and 2KB of SRAM memory. The sensor board's got 8 infrared sensors and its acquisition is multiplexed to minimize the required IO pins. Also, an ambient light cancelation is performed so that the robot could be able to run in different light conditions and (almost) over any surfaces. The picture on the right shows the simulator developed to test the algorithm in the PC. It helped me to tune the PID controller and to check all the computation done by the microcontroller. Basically I developed a tiny "RTOS" for the ATMega32 with a cyclic scheduler to achieve the acquisition, computation and PID task in Real-Time at the desired frequency. At these competitions, the robots have to follow a black line over a white surface as fast as possible by taking the correct way in all the branches. The right way is indicated by a small black line located in the side to which the robot should take in the incoming branch. For this reason, the algorithm's got to be accurate enough in identifying the marks and branches as well as smooth enough to complete the track as fast as possible. Also, the track has got 90 degrees corners which usually become the headache of the competitors. In this video you can watch Slayer in the Final round of Robolid 2006 competition. It got the fastest time and no penalties because it took all the branches correctly. 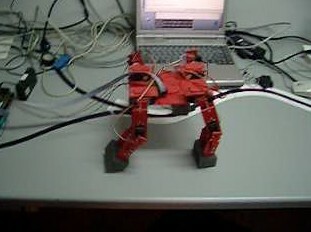 This robot was developed by my colleague and friend Alberto Calvo and me during our studies at University. We got the best possible mark because of the originality and complexity of it. It's got 8 Hitec servos (2 per leg) and it could perform some nice sequences of movement which looked really natu ral. All the control was achieved inside a Xilinx Spartan II FPGA and the code was entirely written in VHDL. The servo controller was a hardware core which accepted a 8bit word for the position and another 8bit word to set the desired speed. The sequencer and the interface to the PC was implemented inside a PicoBlaze microcontroller synthetized directly into the FPGA. There was no kind of feedback and it just played the stored sequences in its memory but it was quite flexible since we managed to simulate them on the PC. This is an old project (2003) and due to a data loss I cannot recover any videos or screenshots but I will try to rebuild it someday.